There are not many things more beautiful than a fall pumpkin topiary. I love incorporating the fall colors with a variety of pumpkins, dried flowers and garlands. Faux foam pumpkins come in all shapes, sizes and colors and if you don’t see the one you like, you can always personalize them! 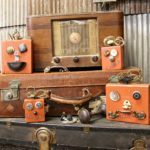 I must confess that I got so excited doing these projects that I did not do a good job about taking pictures as I put this together but it was really easy…I promise! I already had the urn. I emptied my summer flowers out of it, gave it a good rinse and voila…it’s an urn for a pumpkin topiary! Step 1) Cut a piece of floral foam to fit in the bottom of the urn. Step 2) Using a hot glue gun, spread glue all along the bottom of the foam block and press it to the bottom of the urn. Step 3) Stick dowel rod into the foam block. Step 4) Using a drill and large drill bit, drill holes in the bottom and top center of the pumpkins for the dowel rod to slide in. NOTE: Do not drill a hole in the top of the top pumpkin. You wan’t to leave the stem on this one. Step 5) Place spanish moss or filler on the lip of the urn (no need to glue it down…the pumpkin will hold it in place). 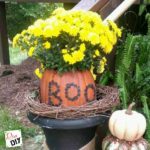 Especially if you want to use the urn for something else next spring; just pull the dowel out with the pumpkins and store to put back together next year. Step 6) Slide the largest pumpkin on the dowel rod first and rest it on the moss. Step 7) Place some moss and garland on top of the first pumpkin and then slide the next pumpkin on to hold the moss in place. Step 8) Repeat with the next pumpkin until you are on your last pumpkin. Step 9) Hot glue moss and garland to place them where you want them if needed. So what do you think? The bottom pumpkin was originally bright orange so I aged it to make it look like it just came out of the pumpkin patch! 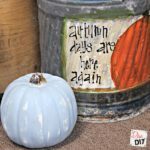 See how here–> How to Make a Realistic Faux Pumpkin. Each and everyone of you inspire me and I LOVE to see the work that you’ve created. Feel free to share with me on Instagram, Twitter or Facebook. And as always, be sure to follow Diva Of DIY on Pinterest and sign up for our FREE Newsletter to receive the latest projects delivered straight to your inbox.